A TRADITIONAL fight to the death with the Daleks takes centre stage in the finale of the revived Doctor Who series in an episode that also breaks new ground with the Time Lord's first ever kiss with his assistant The series doses with Christopher Eccleston, who is leaving the drama, regenerating into David Tennant, the Scottish actor taking over the role. His first words are: "Hello, new teeth. Now where were we?" Saturdays hotly anticipated episode also answers the mystery of Bad Wolf, the words that have followed the Doctor and Rose through the series, which is finally resolved by his resourceful assistant. 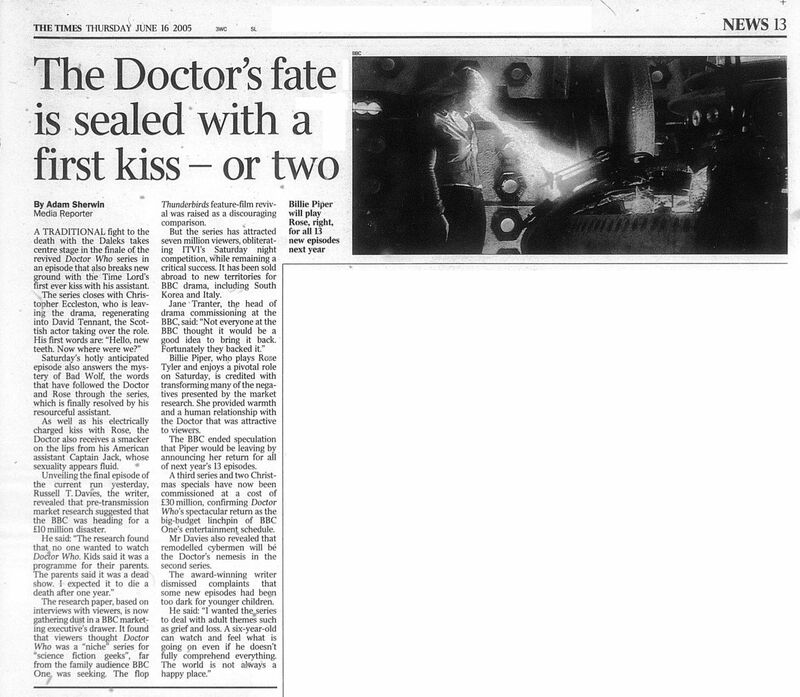 As well as his electrically charged kiss with Rose, the Doctor also receives a smacker on the lips from his American assistant Captain Jack, whose sexuality appears fluid. Unveiling the final episode of the current run yesterday, Russell T. Davies, the writer, revealed that pre-transmission market research suggested that the BBC was heading for a £10 million disaster. He said: "The research found that no one wanted to watch Doctor Who. Kids said it was a programme for their parents. The parents said it was a dead show. I expected it to die a death after one year." Thunderbirds feature-film revival was raised as a discouraging comparison. But the series has attracted seven million viewers, obliterating ITV1's Saturday night competition, while remaining a critical success. It has been sold abroad to new territories for BBC drama, inducting South Korea and Italy. Jane Tranter, the head of drama commissioning at the BBC, said "Not everyone at the BBC thought it would be a good idea to bring it back. Fortunately they backed it"
Billie Piper, who plays Rose Tyler and enjoys a pivotal role on Saturday, is credited with transforming many of the negatives presented by the market research. She provided warmth and a human relationship with the Doctor that was attractive to viewers. The BBC ended speculation that Piper would be leaving by announcing her return for all of next year's 13 episodes. A third series and two Christmas specials have now been commissioned at a cost of £30 million, confirming Doctor Who's spectacular return as the big-budget linchpin of BBC One's entertainment schedule. Mr Davies also revealed that remodelled cybermen will be the Doctor's nemesis in the second series. The award-winning writer dismissed complaints that some new episodes had been too dark for younger children. He said "I wanted the series to deal with adult themes such as grief and loss. A six-year-old can watch and feel what is going on even if he doesn't fully comprehend everything. The world is not always a happy place"
APA 6th ed. : Sherwin, Adam (2005-06-16). The Doctor's fate is sealed with a first kiss — or two. The Times p. 13. MLA 7th ed. : Sherwin, Adam. "The Doctor's fate is sealed with a first kiss — or two." The Times [add city] 2005-06-16, 13. Print. Turabian: Sherwin, Adam. "The Doctor's fate is sealed with a first kiss — or two." The Times, 2005-06-16, section, 13 edition. This page was last modified on 16 June 2015, at 22:24.